We all have them, those lakes and rivers, flats and marshes, creeks and coulees just a little outside our normal milieu, fish and fisheries we put off year after year, not because we’re avoiding them, but because we like the idea of having a fulfillable promise in our back pockets. I spent the past year making good on a number of long-held plans and promises. I waded the homewaters of my Polish ancestors during the first part of the summer, then spent the latter half exploring another mysterious group of rivers: the tributaries of Lake Superior. I fished a number of different watersheds, chasing primarily musky and brook trout, and the revelations were exceptional: I caught beautiful specimens of native fish in wild, often brutal Northwoods country. That said, I held off on one last outing, one last species: Superior steelhead. I wanted a vision to hold onto during the winter months, something to think about while crunching through the snow to work, something to tie for during the deep chills of a Michigan January, something special with which to christen the spring of 2014. That’s my vision, that’s my wish: a fresh chrome fish from Northern Wisconsin’s pre-eminent char and trout factory, the Bois Brule. The Brule strain of steelhead is genetically distinct as Great Lakes fisheries go, a fish that’s celebrated not for its size but for its legendary, spool-smokin’ strength. 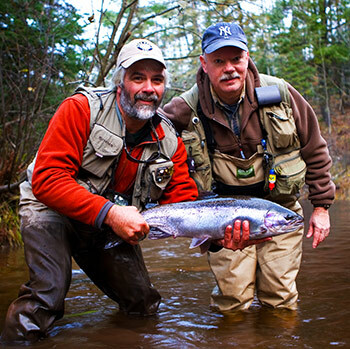 The Superior steelhead is also a more or less untold fish–an attractive quarry for a writer-angler such as myself. We’ve seen and read about the great progenitors of the West Coast, the livid specimens from Lake Michigan, the fat, even keg-shaped Lake Erie fish, the hard-won Lake Ontario incarnations. 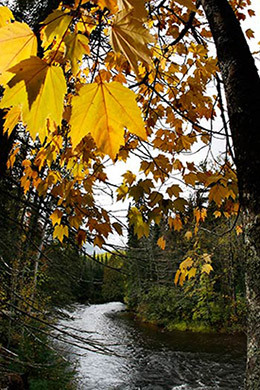 But the hard-scrabble bullet from one of the least forgiving watersheds in the lower 48 has gone largely uncelebrated in the national media, if not uncaught by the regional junkies. In this week’s column we turn our heads to the silver predators that swim the third largest lake in the world. To learn a little more about these fish, and to flesh out ideas for a spring trip, I spoke with Damion Wilmot, a guide who’s spent the better part of his life plying the Bois Brule for its chrome ghosts. MC: What makes these Lake Superior fish unique? DW: Well, they are basically a strain of original wild McCloud fish that have evolved over the past century to survive in one of the toughest, coldest aquatic environments around. Lake Superior is a massive, cold, sterile place—tough for anything to live in. There’s not as much food as in the other Great Lakes, and the growing season is short. Lake Michigan, by contrast, is a virtual aquarium. Natural selection has left nothing but the toughest, hardiest fish out there in the Big Lake. They are a strong, strong fish. I’ve guided guys from everywhere else within the Great Lakes basin, and I would put our fish up against absolutely any other fish out there as far as fight is concerned. Hooking up with their first Superior steelhead a client will usually rear back and say, “Oh, it’s a 10 pounder!”, and I’m thinking, “It’s not a 10 pounder because we don’t get 10 pounders here.” That lake environment is too brutal for 10 pounders. But it’s that same lake environment that selects for the toughest, hardiest fish. Because of the absence of stocking, that’s all we’ve got in these tributaries. MC: How would you assess the health of the current Lake Superior fishery? DW: The past two years have been great, and with successful spawning runs we’re looking at several more years of fantastic runs of fish. But with wild fish, you have good years and bad years. The key is to not hit the panic button and start stocking fish, but accept the fact that there will be modulations. Back in the 1950s, when sea lampreys and overfishing conspired to decimate the lake trout population, steelhead numbers soared. Fish ran up the Knife and Bois Brule in the tens of thousands. Then in the 80s to 90s the population crashed. Minnesota ended up going no kill on the North Shore, and Wisconsin ended up going with one-fish limits—26 inches and over. It’s a wild population, which means it’s subject to things totally out of our control. If you want to have a wild fishery, you have to be willing to deal with fluctuations you wouldn’t have to deal with if it were a manicured fishery. You might have a bad year or two or three. But then things come back. And they come back not because of human intervention but because of natural cycles. And that’s a pretty special thing. Keep the resource pure, keep it wild, keep it special. These fish are worth preserving. Today we’ve got a solid wild-fish fishery on our hands. That’s a pretty cool thing. MC: What does the anadramous season look like on the Superior tribs? DW: It starts with a small run of kings in early to mid-July along, along with a very good push of lake-run browns around the same time. These browns account for some of the excellent mousing we have during the latter part of the summer. My personal best is a 33-inch brown taken while night fishing. The Brule has no dams, so these huge fish come all the way up into the skinny trout water. They can straighten your hook like a harpoon. Next are the coho. They enter the system in late August. They are our most populous salmonoid, and their presence and spawning activity accounts for the success of egg patterns on virtually all of our fish. Guide Damion Wilmot, hoists up a Superior specimen. The steelhead themselves begin flooding the Brule in mid-August, and fishing is good through the close of the season at the end of November. The season re-opens at the end of March. Spring has a few mini-seasons built into it. The first 8-10 days are typically pre-runoff conditions. Low, clear water with plenty of snow and shelf ice in the river bottoms. Indy nymphing with big stones and an egg dropper will take the most fish, but swinging action can be good as well. Once we get runoff, the river gets ugly for a week. It’s not a bad time to swing large, flashier baitfish patterns. When the water comes back down, the fish head up on the gravel, and they’re there until late April or so. Swinging can be crazy good in late April and early May. Presenting baitfish and leech patterns to those drop-back fish is one of the highlights of my year. These fish absolutely clobber a swung fly. The hit is sick. The rod gets just about ripped out of your hands. They are packing calories on at that point. They are aggressive and mean. MC: Is the water boat-friendly? DW: Not so much. 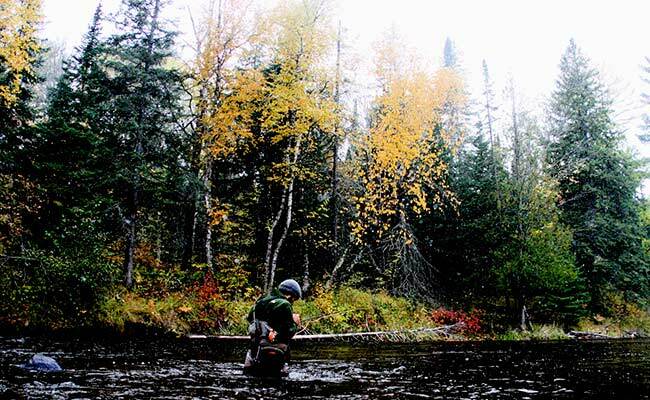 An angler on the Brule should expect to do a lot of walking through a cold, austere, pristine environment. Size-wise, it’s right in that sweet spot. Large enough that you can fish any presentation you like, but small enough that you aren’t contending with a lot of boat traffic. Almost nobody floats the river—it’s too small for a drift boat, but you do see the occasional canoe. The overwhelming majority of the waterway is owned by the State of Wisconsin and is part of the Brule River State Forest. There’s plenty of access. MC: Are there any particular outings that stand out in your mind? DW: I remember one day bringing a friend out to the Brule for the first time. He’d been a Michigan trib angler his whole life. He got spooled by the first two fish of the day. The third took off like a torpedo, skipping across the pool like a stone, out of the water just as much as it was in. It finally jumped over a birch log and broke him off. My friend, now 0 for 3, just about threw his rod in the river. “How in the —— do you land these things?” he asked.